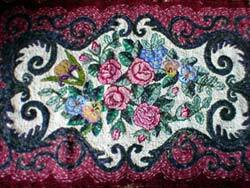 The traditional folk art of rug hooking reached its zenith from about 1850-1920 in the coastal communities of Maine. The craft rapidly spread north through the Maritime provinces of Canada and south to the Cape and Islands of Massachusetts. 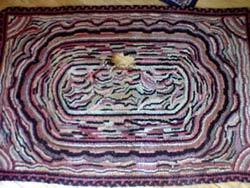 It is thought that a process similar to rug hooking was employed as early as the ancient Coptic and Egyptian cultures, and of course now rug hooking is a popular craft for children and adults everywhere. Using simple materials, primarily re-cycled woolen fabrics and hand made hooks, farmers, sailors, and thrifty housewives made images of their pets, garden flowers, and homes. They were not professional artists, but simply wanted to warm their floors with their creative and practical efforts. These early rugs now command premium prices at antique auctions due to their charm and eccentricity. 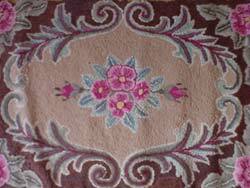 I welcome the opportunity to study and repair antique hooked rugs. My services include delicate inch-by-inch cleaning and restoration as well as a comprehensive evaluation and appraisal. 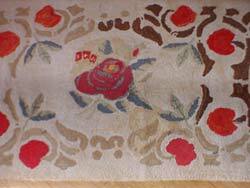 I love the process of researching the history, provenance, esthetics and local context of individual rugs. Please contact me directly for customized service. See the complete repair process. For more information, order a personally signed copy of the book Finishing Hooked Rugs. A must for all rug hookers!